I have already attended several events at Der Brennerhof, Immendingen, most of these, however, had to do with wine or beer. As Christian, Jens and I usually hold our whiskySBH meetings there for the German Tasteup, it made sense to expand the offer. Together with the hosts Brigitte and Klaus, we therefore planned the first Scottish whisky menu evening at the Brennerhof. Brigitte and Klaus were responsible for the food, while we guys took care of the whisky and the obligatory surprise treat. So we told the participants interesting facts about each distillery and the whisky offered. The response from participants was positive across the board and as the cook, Brigitte outdid herself with the food. The whisky menu at a glance. You can find more information about the whiskies, including tasting notes, at the German Tasteup website. More pictures will be coming soon in my Flickr-Album. 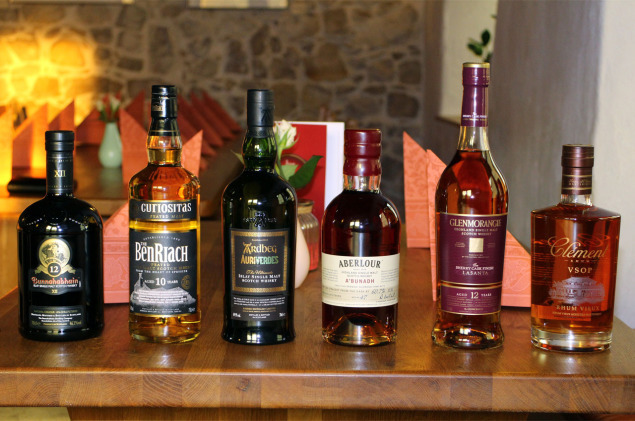 Just between us, I can already tell you that in the first quarter of 2015 there will be an almost identical Scottish whisky menu evening at Der Brennerhof.